Donald Dakeyne was born in 1931 and educated at Bolton College of Art, and Bretton Hall. Originally trained as a book illustrator he became head of the Art Department of a large comprehensive school but now paints full-time. His work has proved immensely popular with both galleries and private collectors in this country and the United States of America. Donald Dakeynes subject matter is usually landscape and buildings executed in pen and watercolour; he is a topographical artist who has a remarkable gift for presenting the unique beauty of the North Western landscape, and in his urban scenes, a delightful way of reminding people that not all our mills are satanic, nor all our industrial heritage ugly. "A topographical painter of a high order; his colour sense is subtle and seems to produce scenes with a degree of faithfulness that can only be admired. 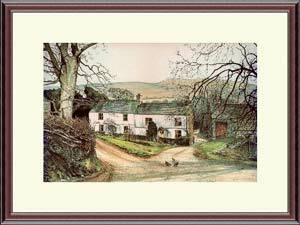 He has almost a photographic eye and a hand which distinguishes the very nature of the countryside." "His paintings of the soil and stones of Gloucestershire could never be confused with his paintings of the soil and stones of Lancashire."